He published two poetry books: Landscapes, Flights and Dictations (2014, Petr Štengl Editions, Prague), Tin quotes, inferiority complexes and human rights or Married, no strings attached, selling dead born girlfriend (mention: worn-out) (2015, Petr Štengl Editions, Prague), now preparing two new titles: They don´t speak Polish in the realm of death and Regular client of the pub At the Land of the Rising Sun. His texts are also published in literary magazines and revues in the Czech Republic (Uni, Protimluv, Weles, H_aluze, Dobrá adresa, Polipet, Tvar etc.) and abroad in translations: Dotyky, Literárny týždenik, Pars artem, Ilegalit (Slovakia), Suštnost (Bulgaria), Fare Voci (Italy), Quest (Montenegro), (California Poetry Quarteryly, (USA), La Otra (Mexico), Cuadernos del Matemático (Spain), Accente, Actualitatea literara, Urmuz (Romania), Our Revue (Israel), Poetry and wine (Kossovo), soon expected in Canada, Serbia, India, France, United Arab Emirates and Ukraine. Present in the anthologies Balkan Poetry Today 2017, Only on the Moon (2018 – UK), Anthology of South-Eastern Poetry by Fahredin Shehu (2018, USA), (California Poetry Quarteryly – Anthology, (USA, 2018). He translated a lot of authors and books from Czech and Slovak into Romanian (especially poetic works and theater plays, but also novels and short stories). He is also translating from English, French, Slovak and Romanian into Czech. He also put together and translated the first two anthologies of contemporary Czech poetry in Romanian (2015, respectively 2016) and the first anthology of contemporary Czech theater (2016) after the fall of communism. He belongs to the Czech section of the PEN Club and also to the Romanian one, is a member of the organizing team of the International Literary Festival Poetry Day in the Czech Republic and organizer of cultural events in the Czech Republic, Slovak Republic and Romania. From 2015 to 2016 he coproduced and co-moderated the Reading Poetry literary evenings and now is coproducing and co-moderating the series of readings and literary programs Poetry in the Front Room. He also cooperates with the Poetry Festivals FIP Bucharest, FIP Jassy and Transylvania in Cluj. 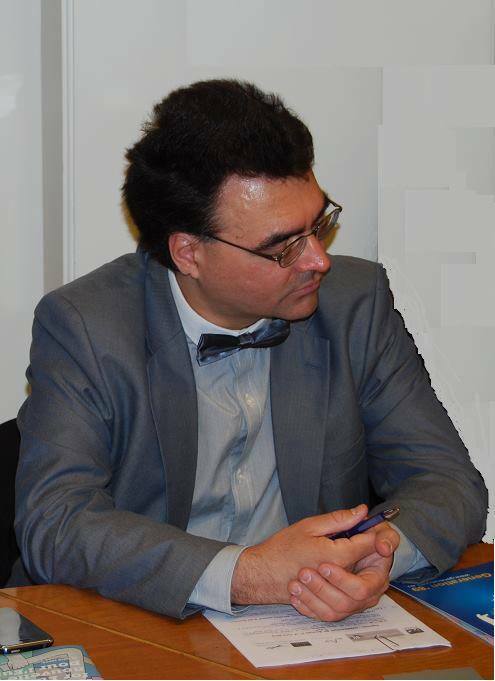 He is also the moderator of the PEN Romania Literary Evenings that started in April 2018.